Having a home that is clean and smelling fresh can be incredibly rewarding. 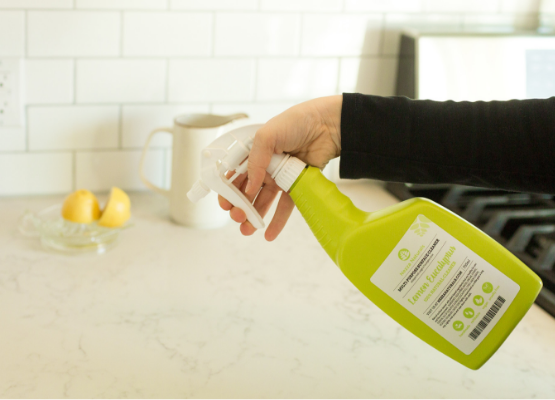 Nezza Naturals’ plant-based products are not only useful to eliminate bacteria and germs, but they are also completely safe and healthy to use in your home environment. In this article, we will be taking a look at how you can make natural homemade cleaning products using simple ingredients. Keep reading to learn more. Cleaning your home is supposed to promote the health and well-being of your family. However, many commercial cleaning products that we use every day contribute to indoor air pollution and can be poisonous if someone ingested or inhaled them. Natural products, however, are safe to use in an around your home as they aren’t harmful to your family, pets, or the environment. If you use the correct ingredients, your cleaning products can be used to rid your home of more harmful pollutants than commercial chemicals alone. Making your own cleaning products can also save you money, as natural ingredients are typically more affordable than commercial solutions. Chances are that you already have a few of these natural ingredients in your home! Bonus! In addition to the health benefits and cost savings, making your own cleaning products can also be a ton of fun. Enjoying the scents of essential oils and coming up with formulas can transform your house cleaning experience. Why Are Essential Oils So Good for Cleaning? Essential oils are extracts from different parts of plants that have antimicrobial properties, including roots, woods, barks, flowers, petals, leaves, and seeds. Some essences even come from fruit peels. Baking soda is one of the most valuable cleaning ingredients in your home. It takes care of odours and has a scrubbing texture for cleaning surfaces. White vinegar is one of the most affordable ingredients. It is perfect for killing bacteria and dissolving grime, mineral deposits, and grease. Olive oil is not only a versatile kitchen ingredient, but you can also use it to clean, polish, and maintain leather and wooden surfaces. Salt is an excellent scrubbing application that you can use to get rid of grime, soap scum, bacteria, and even corrosion. Use vegetable glycerine in combination with essential oils and to give substance to your homemade cleaning products. Vegetable glycerine is especially useful in DIY air fresheners and soaps. Unscented castile soap is the cornerstone of DIY cleaning product making. It is affordable and will get rid of grime, grease, dirt, and stains. Glass spray bottles may not be an ingredient, but they are a MUST-HAVE for product application. Glass bottles are also an environmentally-friendly option that will reduce your home’s plastic output. Follow a task-based approach instead of a room-based approach. Adopt a daily cleaning routine that includes doing the dishes and wiping down your appliances and stove to prevent grime build-up. Formulate a weekly cleaning schedule that accommodates your work and family life. Prioritize the rooms where you unwind and spend the most time, these are the best to keep clean and tidy for our sanity! After pouring the ingredients into the glass bottle, shake it well. Then, spray the mixture on the surfaces and wipe it clean with a damp cloth. Mix all the ingredients thoroughly in a bowl before pouring it into a glass bottle with a pump top. Two or three squirts will be enough for a full kitchen sink! 5. Wipe the surface clean, hey presto! Spray and wipe off any surface you would like to disinfect. Works great for baby change tables, benches, kitchen surfaces, anywhere really! Making cleaning products with organic ingredients is the key to ensuring that you and your family live a healthy and hygienic lifestyle. 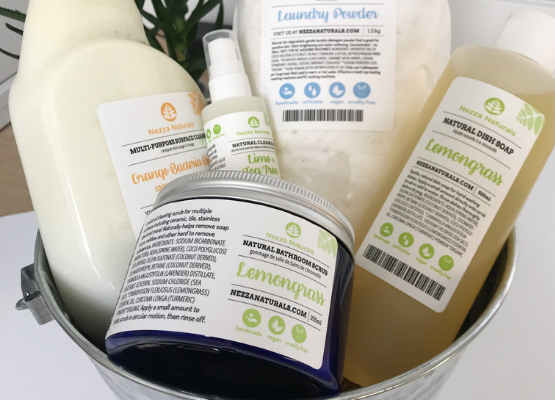 Nezza Naturals has many ingredients you need to make your own cleaning products. Our multi-purpose cleaning products are super powerful and very cost effective as we use a whole lot of essential oil in our formulas. Also our loyal customers say our lemongrass bathroom scrub is amazing!